I’m the developer and maintainer of one f-droid app. I want to figure whether I can drop my compatibility to pre v21 API Android phones to get rid of some hard limitations and problems. To do this I intend to add a survey to my app: You get a dialog, asking whether you want to take part and if you accept you send your android-version to the server. If not nothing happens. In both cases you’re not shown the dialog afterwards. The result can be seen live under a link I’ll add to the dialog. I’m in full control of the server and thus can assert that nothing fishy happens and I only store IP addresses in the web-logs for security reasons for 30 days, which are used by fail2ban. Making it the same as linking to your own Wiki or Repo on github. Now to my question: I know that f-droid is pretty strong against any analytics etc and I’m glad for that, still, as f-droid doesn’t collect anonymized information by their own I need to do this by myself. How does the f-droid community see this? Is this already too much or okay ? I tried to minimize the data footprint as much as possible. If you’re keen to know I’m talking about the vocabletrainer-app. Offtopic, I know, but while trying to navigate to “home” I got a “server not found”. And I can assert that my connection is not a problem, is F-Droid having capacity problems ? I’d like to help. And this: Why is fdroid down all the time? If data collection is opt-in (disabled by default, requires deliberate and informed user action to send it) and there’s a clear explanation of what and why is collected, it’s OK.
Opt-in as you get a dialogue once when starting after doing an update, telling you what will be send. I think it is interesting you have 0 users on API 21. My own app, Privacy Browser supports API >= 19. 19 adds a lot of hard limitations to the app, and at some point I will need to drop it. 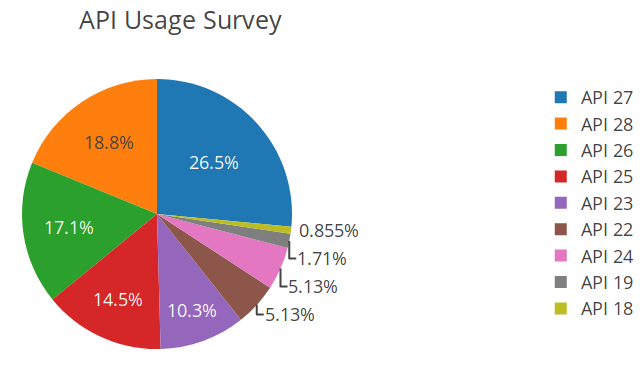 As described at https://www.stoutner.com/2018-financial-report/ I have 3.4% of users on API 19 and 2.2% on API 21 for the flavor that is also released on F-Droid. For the free flavor I have 11.5% on API 19 and 5.5% on API 21. Yeah I’ve also noticed that I have zero v21 users. The survey is still going. As of now 2.26% < v21. Though I’m wondering how one can run this on v18, which is below the minimum configured for the application. Something’s fishy with that quote. It’s a link. A link to a spam-site, instead of the original post of mine.